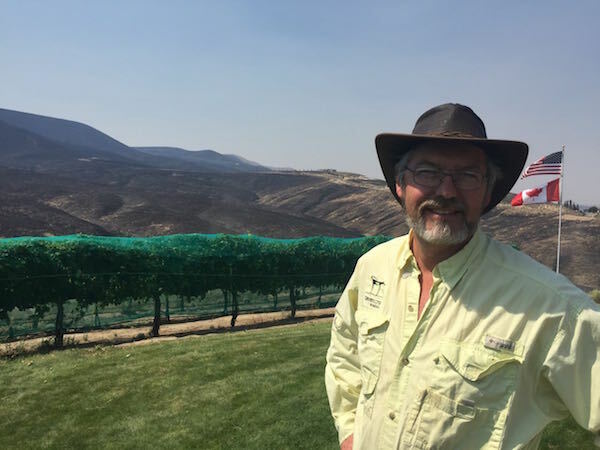 PROSSER, Wash. – An 8,000-acre wildfire roared up to the edge of a winery Sunday afternoon above this Yakima Valley community, then was held back by firefighters. 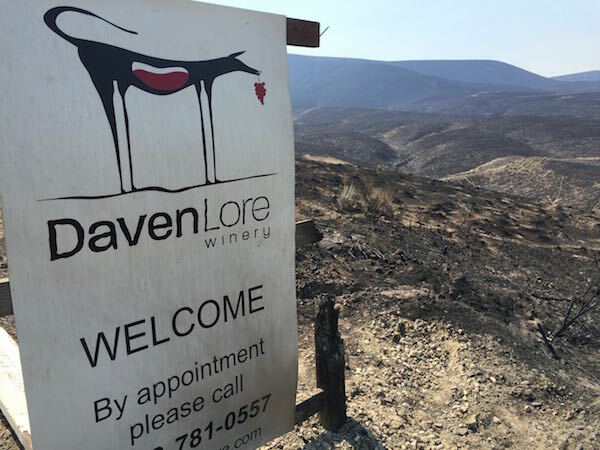 On Monday, Gordon Taylor of DavenLore Winery was rinsing ashes off his vines and assessing the damage that occurred – and pondering what might have been. He said the fire started Saturday evening in an area called Ward Gap about a mile west of his winery and home. It was brought under control right away but apparently flared again about 1 p.m. Sunday. Just as it appeared to be under control, winds began to gust, and that sent flames roaring across the sage-covered hills. 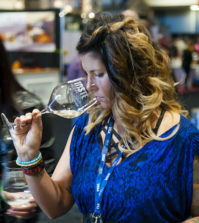 “The firefighters, who did an excellent job, were basically on structure control and made sure all the houses have been saved and let the fire burn past us,” Taylor told Great Northwest Wine. “This was all sagebrush yesterday,” he added, waving a hand around his property. DavenLore escaped with minor damage. A sign along the gravel road was partly burned. 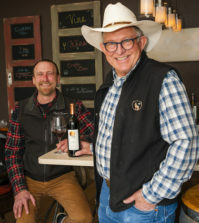 A taillight and a tire on a trailer were melted – as was some bird netting that was destined to cover Taylor’s small estate vineyard. Along every edge of the property south of Prosser toward the Horse Heaven Hills, the fire had approached. The blaze also burned down the hill toward Prosser, coming right to edge of Highway 22, perhaps two miles from wineries such as 14 Hands. This was one of five wildfires that burned Sunday across Eastern Washington. According to the Tri-City Herald, about 150 homes were evacuated in the Prosser area, and flames threatened at least 30 of those homes. Taylor did not evacuate his home – mainly because there wasn’t an opportunity to before the flames swept down the hill and past his winery. The cause of the fire is unknown. Taylor said the area of Ward Gap Road where it started is a favorite location for target shooting. By Monday morning, firefighters from as far away as King County were helping to check for hot spots along the still-smoking hillside. 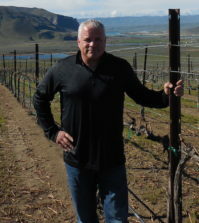 This is the second wildfire to threaten a Yakima Valley winery in the past few weeks. On July 14, a wildfire in the eastern Yakima Valley above Benton City came within about 100 yards of Anelare Winery in the unincorporated community of Kiona. The 4,000-acre fire also smoked a few Chardonnay vines along the edge of Skyfall Vineyard, which is owned by Precept Wine in Seattle. On the opposite side of the Yakima Valley, a 70,000-acre wildfire raged on both sides of Rattlesnake Mountain. That fire started at the Yakima Training Center on Saturday and burned east into Benton County on Sunday. On Monday, firefighters set fire to the Arid Lands Ecology Reserve on the north side of Rattlesnake Mountain, a tall treeless ridge that forms the northern boundary of the Yakima Valley. The Arid Lands Ecology Reserve borders the Hanford Nuclear Reservation, and officials were concerned a wildfire could jump the highway and threaten contaminated areas at Hanford. 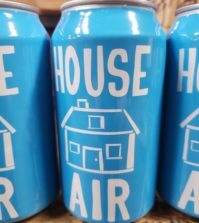 In 2000, a 165,000-acre wildfire in the area destroyed 11 homes in Benton City, threatened wineries and vineyards on Red Mountain and burned up against radioactive waste facilities on the Hanford reservation, according to the Tri-City Herald.